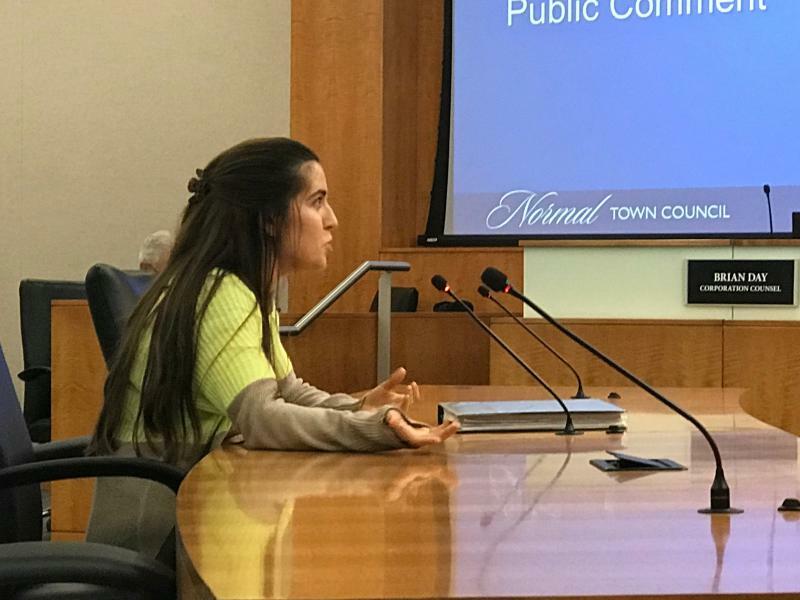 Illinois State student Andrea Gilleran speaks to the Normal Town Council on Monday, July 2, 2018, presenting the council with a binder of 3,000 student signatures supporting a town recycling ordinance. 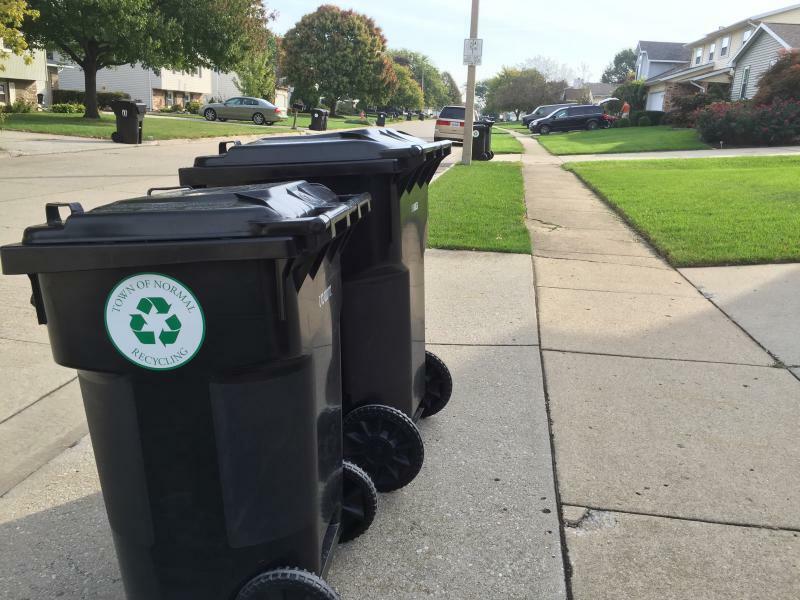 Illinois State University students living in off-campus apartments have lobbied for more recycling options for years. Several ISU students attended Monday's meeting. The change requires all multifamily properties to have recycling units alongside their trash recepticals. Rental property owners present at Monday's meeting voiced concerns over losing parking due to the extra space needed for recycling bins and called for a change to the ordinance. There was an effort on the council to postpone the ordinance and employ pilot programs that would eliminate the current one-size-fits-all approach. But council member Kevin McCarthy said time is no longer on their side and action must come now. The ordinance passed 4-2. R.C. McBride, Chemberly Cummings, Mayor Chris Koos, and McCarthy voted in favor. Jeff Fritzen and Kathleen Lorenz voted against it. (Lorenz sought unsuccessfully to delay the vote, hoping to gather more information through "field tests" over the next year.) Scott Preston, who was the lone "no" vote against the county's 20-year solid waste plan in February in part over the recycling issue, was absent. The McLean County landfill is expected to reach capacity before the end of 2018. The county's solid waste plan, endorsed by the town earlier this year, says roughly 25 percent of materials sent to the landfill could be recycled. ISU student Andrea Gilleran brought a binder containing 3,000 student signatures supporting the ordinance. “I currently have a recycling bin that’s filled up because we go through more recycling than trash in my house and we have to drive five to 10 minutes in order to recycle it, and that’s completely out of the way. And that’s driving. Most people that are in college don’t even have a car,” Gilleran said. Landlords say they're concerned because students in the past have not properly used recycling bins and they've incurred charges due to the contamination of provided bins. Gilleran said many students have likely grown up recycling at home, and she thinks there will be an effort on campus to make sure students are properly educated about what can and cannot be recycled. “A lot of the things that college kids go through are recyclable items. ... We drink beer, we have beer cans. You just want us to throw all of that out? That’s so much trash,” Gilleran said. Speaking Tuesday on GLT's Sound Ideas, Koos also tried to reassure opponents of the ordinance. Koos said apartment complex owners should not worry that the ordinance is written in stone, even if there are problems in implementation. "I think it's just the culture of the council. If there has been pushback on an ordinance that we have passed because of unintended consequences, the Normal Town Council does not have a history of digging their heels in and saying that's the law. We'll work with the aggrieved parties," said Koos. For instance, Koos said he believes that Ironwood Gardens owner Steve Snyder has a point in objecting to the impact on very large developments. Koos said staff will address those issues. McCarthy made similar comments at Monday's meeting. An excerpt from GLT's interview with Normal Mayor Chris Koos. Editor's note: GLT General Manager R.C. McBride is a member of the Normal Town Council. 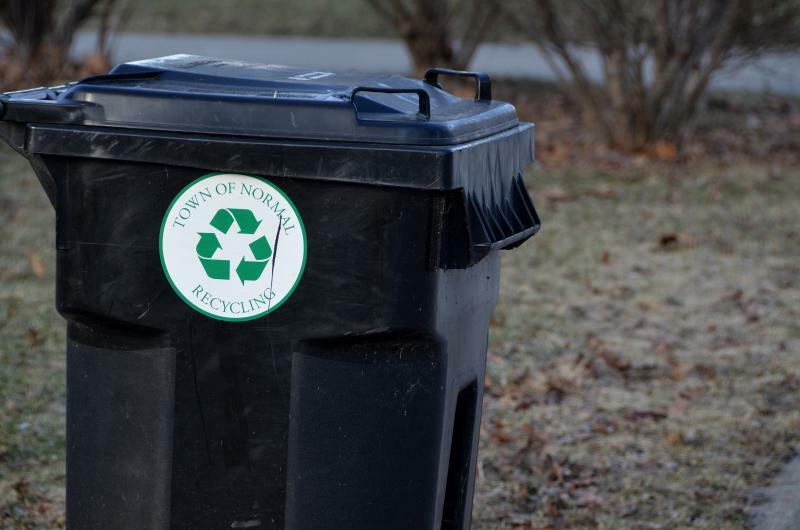 The public will get its first look at the Town of Normal’s proposed multifamily recycling ordinance during an information session Thursday. 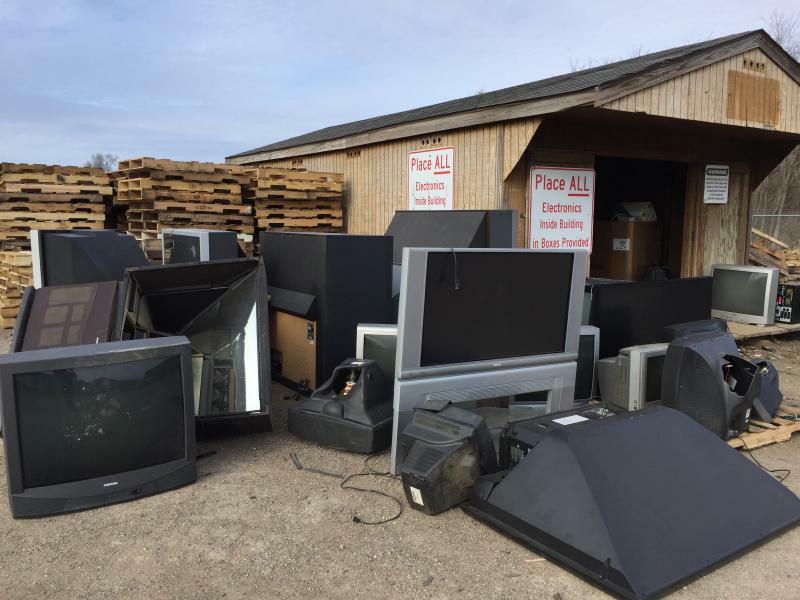 The Ecology Action Center said Tuesday that McLean County residents will soon have a more “reliable and sustainable” e-waste recycling option even after two nonprofits stop accepting old TVs and computers.